You guys! I’m so excited to finally share my guest room CLOSET MAKEOVER with all of you! 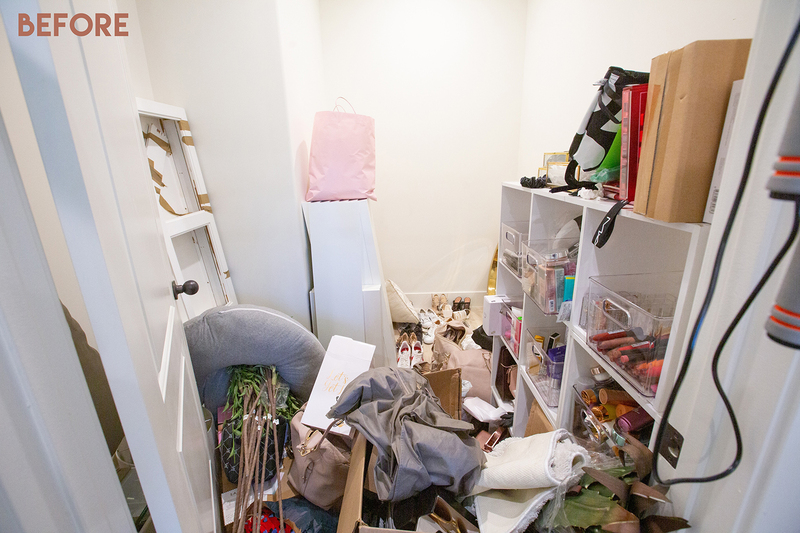 This space was a disaster since we moved into our house because I started using this bedroom and this closet as a storage space, but things got out of control to the point where I looked like a hoarder! I knew that I needed help from professionals that could sort and make sense of my mess! Life in Jeneral came to the rescue to help me purge, declutter, and organize all my things into a beautiful, functional, and durable storage closet, thanks to the help of the Container Store! For those of you who have been following along on our home renovations, you may know that we’ve saved this guest bedroom and closet for last because dealing with our hoarding situation has just been too much for us to manage until now. You guys, I swear I consider myself to be a rather organized person, and if you’ve seen the rest of my house in our videos, you know it’s pretty tidy! But for some reason, we seem to have a pattern of unintentionally turning our spare room into a junk room lol! Remember this haha?! The Life in Jeneral team was incredible to work with and made the whole process from inception to completion easy. 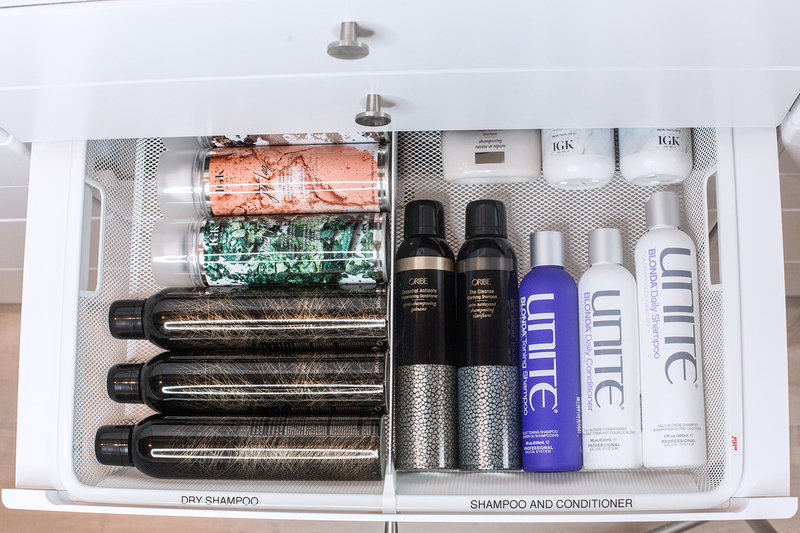 Having a clean and intentional space to store my beauty products, bags, shoes, and jackets, has given me peace of mind and makes organizing new product so much easier as well! It’s also become more clear to me to decide what items are really worth hanging on to, and what can go. This closet is not huge, but the team used every available nook and cranny of space and built up! 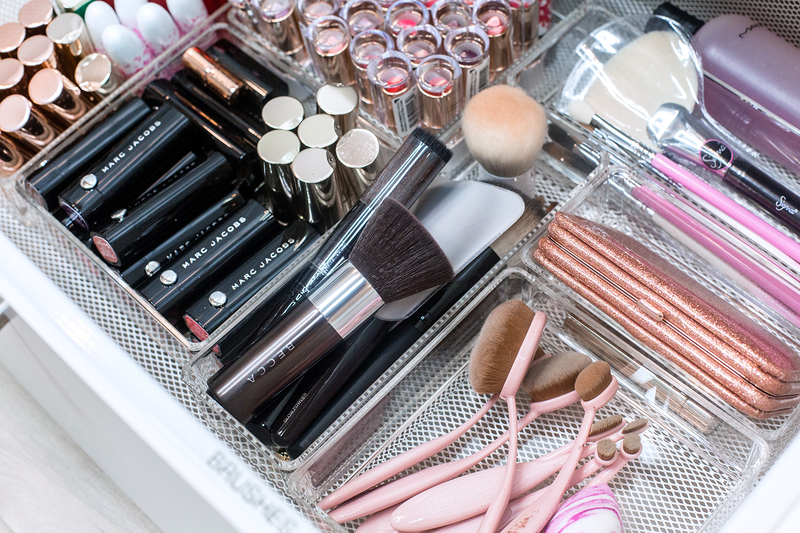 Everything from categorized makeup drawers, to 3D shoe racks, acrylic organizers for jewelry, head bands, and perfume, make the space so intuitive and helps this space to stay neat all the time! This customized unit by Elfa is honestly life changing! Before Life In Jeneral, I was throwing all of my PR package goodies into bags and not knowing where anything was. It got to the point where I wasn’t trying any of my new product and not even wanting to be creative and shoot videos because my makeup storage situation was so overwhelming. 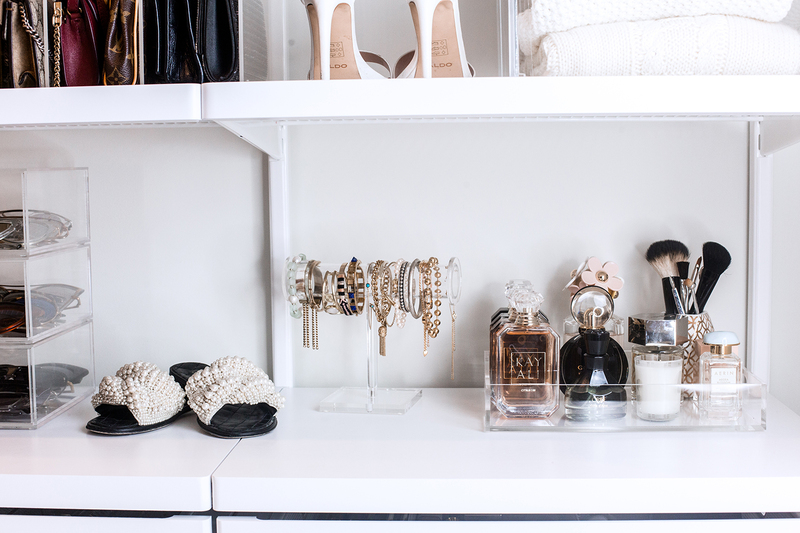 When we first started planning this closet, my biggest priority was figuring out one big area where I could store all of these beauty items. Life in Jeneral came and accessed, and we agreed the best way to store everything was by having a drawer unit with seperators inside each drawer. For the product categories, I have all skincare drawers on the left side, then hair and travel sized items in the center, and makeup on the right side. The team labelled every category for me in the drawers so it’s easy to know exactly where to find and store everything. A lot of the time, I’m in a rush when putting things away or need to quickly grab a product for filming, so labelling all the drawers really comes in handy! 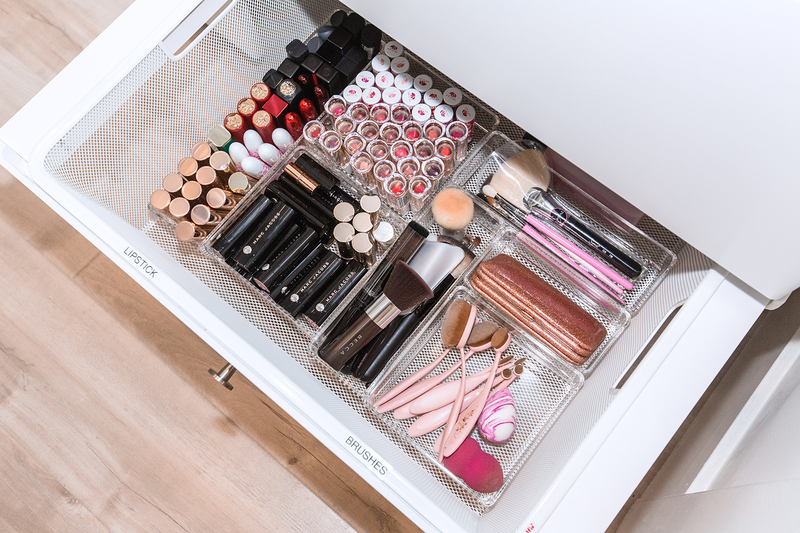 These acrylic drawer organizers are vital to organizing each product category and come in different shapes and sizes to optimize the space of each drawer! This necklace wall rack is the perfect solution to tangle-free necklaces! This display saves so much time for me in the mornings when I’m getting dressed. I can finally see all the necklaces I have and coordinate with my outfit! This display may be my favorite part of the entire closet! 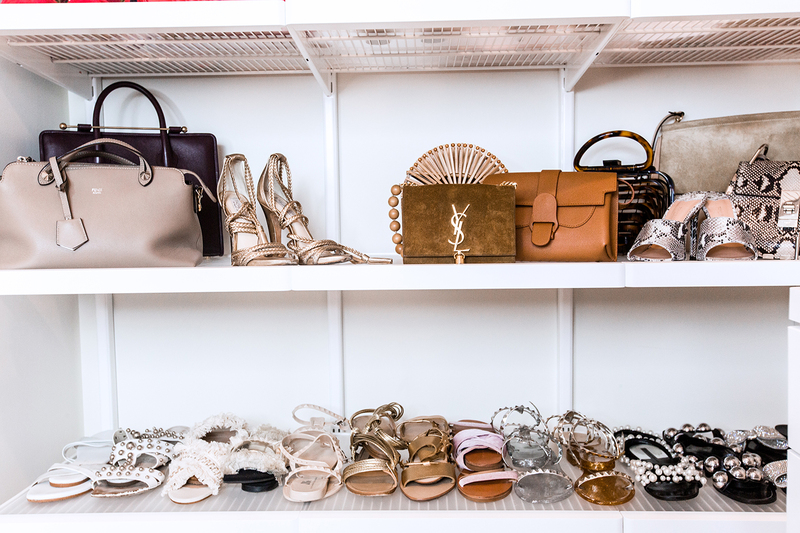 I love seeing my favorite bags and shoes that I have on rotation displayed and easy to reach. Handbags and shoes were the most disorganized area in my closet. Previously, I would just have all of my beautiful designer bags piled on top of one another which honestly makes me cringe! I love these clear acrylic clutch & small purse organizers because they’re the perfect size to fit my small bags and make organization look so chic! For the higher shelves, we used these pretty woven baskets to store things that are seasonal like swimsuits, winter scarves, makeup cases, hats, etc. I don’t use these things as often, so it makes sense to keep them higher. When needed, I have a small ladder right outside the closet to access the higher shelves! These elfa gliding shoe racks are my new favorite solution to organizing a lot of shoes and being able to see all of them. If you’re a shoe lover like me, this system is perfect to systematically display your prettiest shoes and have them well organized and within easy reach. Each level fits 6-7 pairs of heels and rolls out so you can access the shoes in the back. I also love these clear boot containers on the top shelf, they’re perfect because they’re not only stackable, but you can actually see what boots you have on the inside. All of my knee high and winter boots are stored away on this top shelf since it’s now spring and I’m not wearing them on a regular basis. Life in Jeneral created these custom accessory organizers with components from the luxe acrylic collection. I love that these drawers are sold individually and can be stacked in any way you want, so if I ever need more I can add another level or two to one of these existing boxes. They’re clean, simple, and look so chic on the countertops! 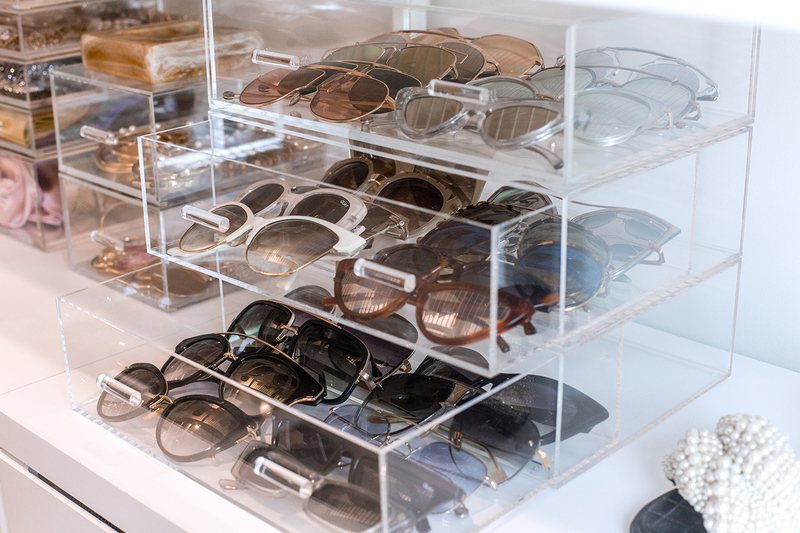 Previously all my sunglasses and jewelry were thrown into different travel jewelry cases, and stuffed into drawers around the house! Just incase you guys were wondering what my hoarding situation looked like…here it is upfront and centre ha! Can’t believe this was my reality for so long! No more hoarding here! What do you guys think? If you have any questions at all, please leave them in the comments below and I’ll answer asap! And if you’re thinking about refreshing your closet or doing some spring cleaning, the Container Store is having a closet sale now through May 19th with most of these items up to 25% off! A huge THANK YOU to the Life in Jeneral team and the Container Store for helping me transform this space! Great work Beautiful! Now I can hire your magic hands to do the same for my closet now. hi hi hi! Where can I get this beautiful dress? :) thank you! OH this was so fun to watch girl! It’s gorgeous! 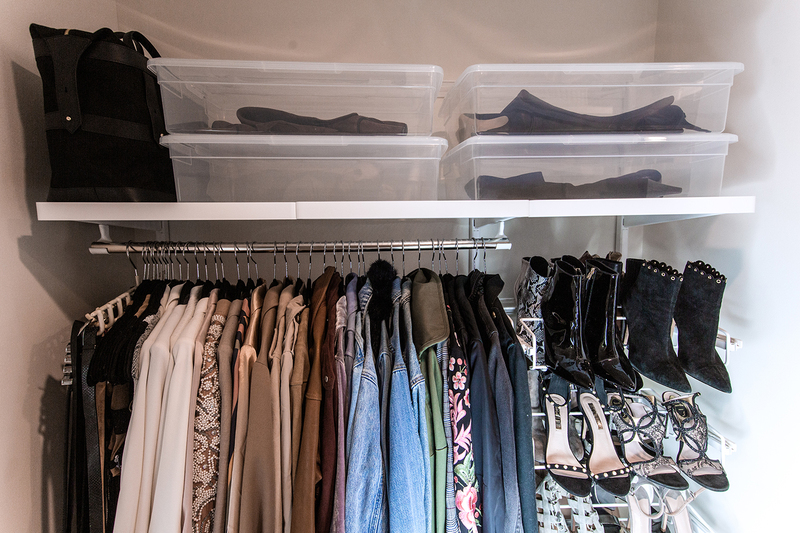 Your closet looks amazing. 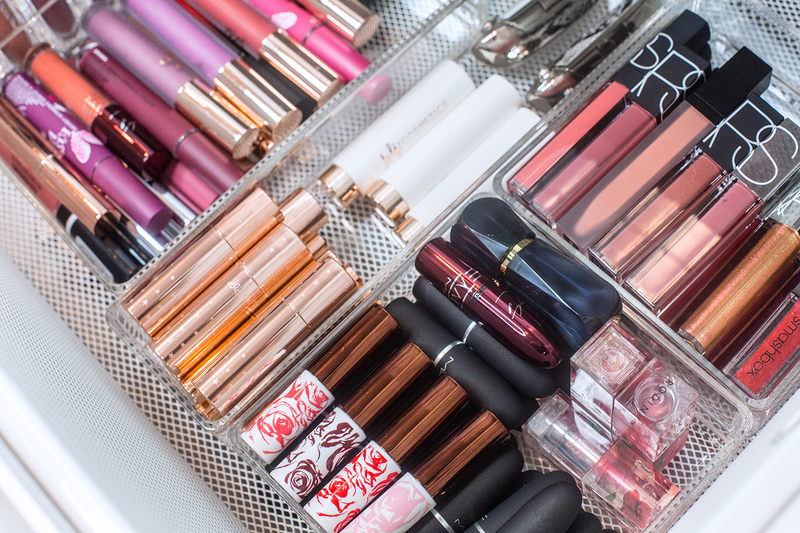 I love how you organized everything, including your make up. Plus, you look stunning in that dress. This is amazing!! What a HUGE difference! You have given me lots of ideas and storage solutions. Thank you hon! I’m in love with your closet!!! I need one like yours!! Such a huge transformation! It looks like the perfect closet space! Great work! Your closet is fantastic. Love the dress? Where is it from? Oh wow! You have such a great closet. 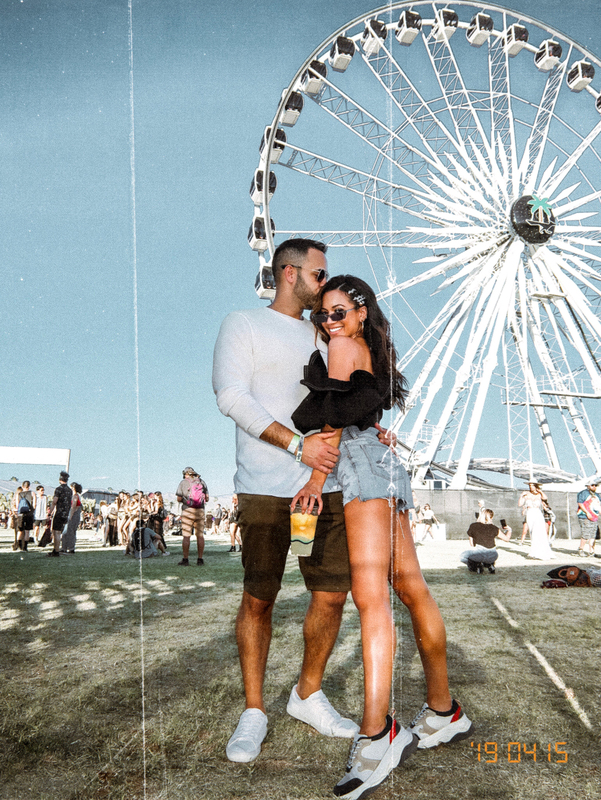 It’s goals and i love that outfit you’re wearing . What a gorgeous closet you have here dear!